From the Hancock County Courthouse, travel east 2 blocks on Broad Street. Turn right on Boland Street, which becomes Linton Rd., and travel on Linton Rd for about 8.6 miles to Beulah Highway, which forks off to the right. Follow Beulah Highway for about 4.6 miles to Butts Road on the right and Dixon Road on the left. Turn left on Dixon Road. Follow Dixon / Young Rd for about 3.8 miles (bearing to the right after 2.4 miles where Trawick Rd comes in from the left). Young Rd deadends at Minor Rd. In front of you is a metal, locked gate. Walk past the gate for about 200 yards and turn left on the first trail. Continue for about 0.4 mile, going past the now-gone Oscar Trawick house site on your left and past the first trail to your right, to the second right. Turn right and go about 200 feet to where the trail seems to end. 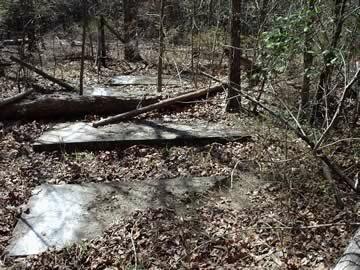 The cemetery will be to your left front side, about 150 feet into the woods. This cemetery is nearly impossible to find without a GPS. The cemetery has at least two rows of slabs, which are partly covered with logs and pine needles. The 2 in the death date of 24 is difficult to read. Birth date impossible to read. Not able to read death date. Death month may be Sept.
Inscription worn off; cannot read it. 2 graves possibly those of the Trawicks or Carl Robinson listed below. Slab under a large log and difficult to read. Buried somewhere in this cemetery, per H. B. Dixon.